"Poetry in Process and Book of Magazine Verse"
This piece is about five printed pages long. TH E T H I R D Vancouver lecture is in many ways the most contrary and least accessible of Spicer's lectures, but it may also be the one that most repays the study it requires. On the surface, the lecture strays and rambles, but interspersed in the repartee of questions and answers are some of Spicer's most interesting and enigmatic statements on his art. At this point in the lecture series, Spicer and the audience have become intimate enough to lose patience with each other, challenge each other's basic tenets, talk loudly at the same time, and burst into laughter at the slightest inside joke. As Spicer may have intended, the audience itself has begun to appear divided on the basis of just how seriously they take his propositions. Spicer, in turn, while declaring that he wishes he could stay in Vancouver, proceeds, directly and indirectly, to insult the local magazines Prism and Tish. Again, it is important to realize that Spicer repeatedly creates and sustains around him a vortex of dissent, but he is no less utopian in his thinking because of it. In many ways, dissent is Spicer's utopia. Since a community of heterogeneous members could never live in agreement without becoming a tyranny, it seems the only hope would be to value instead its disagreements, to see argument as progressive, and to create a context for heterodoxy. For Spicer this means creating a community or "city" that is open at its center, and through the course of the lecture this open center becomes represented by the baseball diamond that he places at the heart of the city - a kind of absurdist's town square, which is publicly shared and therefore always potentially "in play" and in which no individual player is allowed to dominate the "game" but everyone, in turn, is required to participate. It's a community of informed and engaged constituents who are committed to the regionalism and teamwork of their shared game. 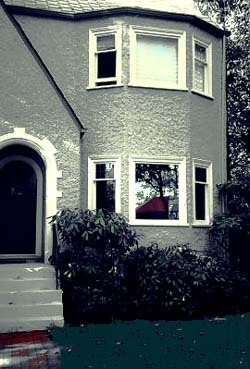 The Tallman's house in Vancouver, where this lecture was held, in the front right downstairs room. It turns out, in fact, that baseball works for Spicer as a model of individual and social composition; in the lecture he uses it to describe his practice of dictation and in his last book, Book of Magazine Verse, the diamond becomes an incarnation or synthesis of heavenly and earthly cities. If magazines are societies, as Spicer reiterates in Lecture 4, then this, Spicer's last book of poems, constitutes a community of peers with belief systems that are ordinarily not on speaking terms but are here brought into play, echoing and contradicting each other: The Nation (Politics), Poetry (Verse Culture), The Sporting News (Game), Ramparts (Theology), Downbeat (Jazz), etc. For Spicer, as for Blake, this contrariness is generative. Gesturally, the confluence of Spicer's last book (Book of Magazine Verse, which he refers to as the building of a city), his last line of poetry ("People are starving"), and the last words in his lifetime ("My vocabulary did this to me") constitute either his deepest moment of correspondence or a true magician's great and final trick: to disappear while remaining everywhere manifest, appearing and disappearing in the margins of things, as in the startling poem he dedicates to himself in Admonitions. Like love is . . .
On these grounds Spicer's use of Christianity makes sense; it is both more heretical and more ecstatic than it first appears. In his poems for the Catholic magazine Ramparts, he is at once mocking and faithful; his Christ is the magician whose greatest trick was his own incarnation. Spicer loves to use low terms to discuss high aesthetic practice, especially when it jeopardizes the authority of critics over the work of the poet. His practice is very Keatonesque in this sense; he is most in control when he appears to be most offhand. Though Spicer claims in Lecture 1 that his choice of the term "Martian" is not to be taken too literally, its choice is purposeful. Likewise, Spicer uses baseball humorously as a metaphor for poetry, but thereby grounds poetry in a profoundly appropriate vocabulary of fair play, teamwork, democracy, and popular culture, particularly the culture of radio. For Spicer, baseball offers an ideal correlative to poetic composition with its model of mutuality, reciprocity, fraternal competition, gaming, and even "stealing" for the greater good. Neither player nor poet can exist alone. Both are absolutely dependent on the rules of their trade, their ability to cheat, the existence of tradition, and the regionalist team spirit of their peers. In addition to undermining the militaristic seriousness of the avant-garde, Spicer's baseball vocabulary offers a joust at Olson's theory of composition by field, especially considering it as the very heart or projective center of the ideal city, Olson's "polis." At the outset of the lecture, Spicer wants to convey that he's taking a risk, sacrificing himself to the experiment of reading one of his own poems still in progress, for the sake of better understanding the process of poem-making in spite of his overstated fear that this may interfere with the process of the rest of the poem. In any case, he is violating the rules of serial composition which he elucidates in the first two lectures, by looking back. In Spicer's cosmology, the "not looking back" is, as for Orpheus, a kind of ideal, a rule, but one that is inhuman, a rule one can't help but "cheat" at. For Spicer, rules and cheating are, conceptually, of equal importance for the poet. As much as Spicer argues for not looking back at a serial poem and not revising one's work, he drops a number of clues that this is not necessarily something practicable. Discussing a poem in progress and performing its process are in fact historically crucial to Spicer's practice. The community ritualizing of the writing process has been one aspect of Spicer's work since the Berkeley days, through the Magic Workshop, the Sunday poetry meetings, Open Space magazine, and his long-term friendships with Blaser and Duncan, which included extensive, playful, and sometimes scathing critiques. His tactic of group intervention is reminiscent of the Magic Workshop when Spicer assigned his students to write a poem that would make him write a poem. As a charlatan and dissembler Spicer also seems to delight in creating the drama of an Event, like a magician who shows the audience the daggers that are about to pierce the box with the body in it. The daggers are real but the scene is accomplished with one of Spicer's most impacted metaphors for composition: the composite mirror that reflects the poem back at him through its readers. Peter Gizzi was born in 1959 and grew up in Pittsfield, Massachusetts. His publications include Periplum (Avec, 1992), and the chapbooks: Hours of the Book (Zasterle, 1994) and Music for Films (Paradigm, 1992). His editing projects have included the celebrated "little magazine" o-blek: a journal of language arts (1987-93), the international literary anthology the Exact Change Yearbook (1995), and The House That jack Built - the Collected Lectures of Jack Spicer (Wesleyan, 1998), from which this excerpt is taken. He lives in Santa Cruz and teaches for the University of California. The Collected Books of Jack Spicer. Edited and with commentary by Robin Blaser. Santa Rosa, Calif.: Black Sparrow Press, 1975. (All references to Spicer's books are as reprinted here). Dark, Alvin, and John Underwood. When In Doubt, Fire the Manager: My Life & Times in Baseball. New York: Dutton, 1980. Ellingham, Lew, and Kevin Killian. Poet Be Like God. Middletown, Conn.: Wesleyan University Press, 1998. Nash, Ogden. Verse from 1929 On. London: Dent, 1961. Tallman, Warren. In the Midst. Vancouver: Talonbooks, 1992. Valéry, Paul. The Art of Poetry. Vol. 7, The Complete Works of Paul Valéry. Princeton: Bollingen and Princeton University Press, 1958.